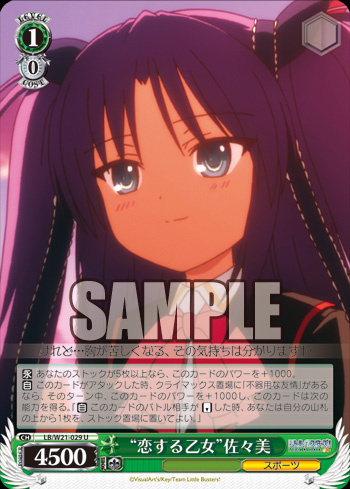 Weiβ Schwarz Cards of the Day: 13th-15th of May | TCG, shiyo? 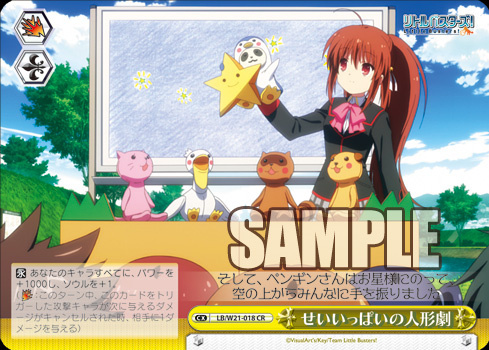 This week we’ve seen yet more Little Busters! 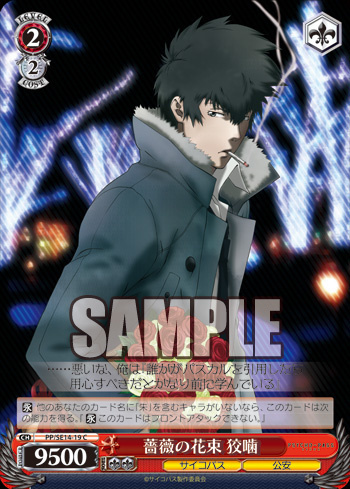 Climax combos alongside some new Psycho-Pass cards that have included a few characters that we haven’t seen yet. 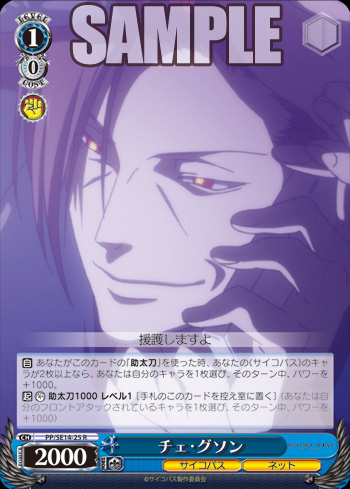 Shiyon is our second Brainstorm card in Psycho-Pass, and this time it’s one you can make use of repeatedly in a single turn. Shiyon can help you set up for future plays by searching for important «公安 Public Safety» cards, and can also help cycle your hand, by dumping less useful cards or Change targets to the Waiting Room. Unfortunately this does also mean you can’t actually gain any resources in the process. This is a trade-off against the fact that she can be used to filter through your Deck for a quicker Refresh though. [AUTO] When this card is placed on the Stage from your Hand, choose 1 of your other characters, during that turn, it gains Level +1, Power +1000. 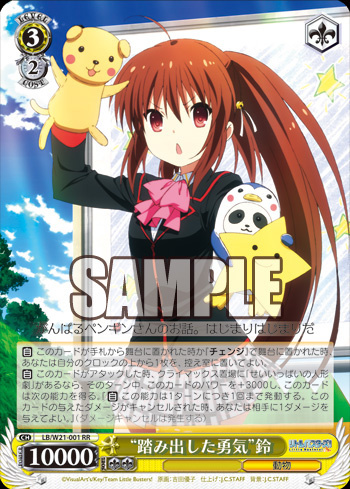 Yayoi is a useful anti-Reverser card that might also come in handy for taking on more powerful cards. However she will only be useful for a turn, and she can’t do anything as a standalone card. Of her two boosts, the Level increase may often be the more useful, since it will allow you to evade the effects of Reversers which require their opponents to be of equal or lower Level to themselves. The Power boost could either help you defeat strong opponents or push one of your characters above your opponent’s Counter threshold. As is usual with these kinds of effects, it will be most useful early on in the game, when the increase is greater relative to your character’s base Power. If she could use the effect on herself, Yayoi would be more useful I feel, but I believe cards of that kind are fairly rare. [CONT] If your Stock is 5 or more this card gains Power +1000. [AUTO] When this card attacks, if [Clumsy friendship] is in the Climax Zone, during that turn, this card gains Power +1000, and the following ability [[AUTO] When this card’s battle opponent is Reversed, you may place the top 1 card of your Deck in your Stock. 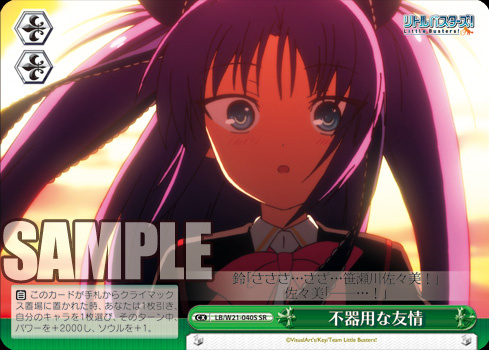 Sasami joins what seems to be a running theme of Little Busters!, which is Climax combos that bestow an additional effect for when the character defeats something in battle. Her first effect can boost her to the level of a 1/0 vanilla, meaning that she at least won’t suffer from a Power defecit during those turns you don’t use her combo. So you can try to make use of her as if she were just a vanilla, but with the added bonus that you’d sometimes get her Climax combo. However 5 Stock might be a bit of a steep target to maintain during the early parts of the game, and especially without expending too many cards. As such you might not always be able to guarantee that Sasami will reach her full Power. Her second effect allows her to become even stronger, but can also be used to increase your Stock. When all her effects and the Climax are accounted for, she could reach 8500, before considering supports. This makes her a considerable threat to many Level 1 cards, and should make it easier to trigger the Stock gaining part of her effect. If you haven’t managed it already, it might even be useful for getting above 5 Stock. [AUTO] When this card is placed in the Climax Zone from your Hand, draw 1 card, then select 1 of your characters, during this turn it gains Power +2000 and Soul +1. The is the Climax that goes with the above Sasami, and will help her win battles. Kogami appears for the first time this week with a very strong Level 2 that however relies on his partner in order to unleash that strength. 9500 is above the curve for a Level 2 card whilst maintaining 2 Soul, so he of course has to come with a downside. In this case it’s the requirement for him to have an Akane around before he can start attacking your opponent’s characters. Considering that we’ve already seen a useful support card featuring her, this might not be too much of a problem, but we’ll need to wait and see what the full set list is like. Even without Akane he can still perform other attacks, and is a big wall for the opponent to get past. He won’t be completely useless without Akane around. 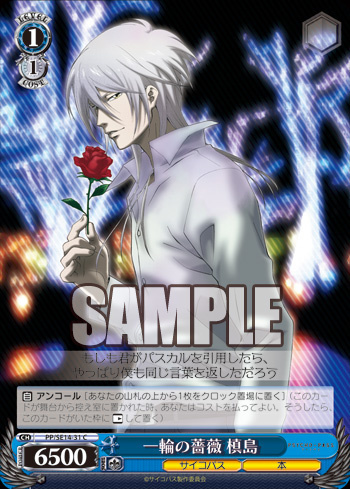 Makishima is back again, and this time with Clock Encore, rather than Hand Encore. This is riskier than the regular type of Encore, but is cheaper resource wise, since you don’t lose any cards bringing him back. This might make your opponent think twice about expending too many resources to try and defeat him, if they’re not going to get any real resource advantage out of it. You probably don’t want to be using this effect too many times though. 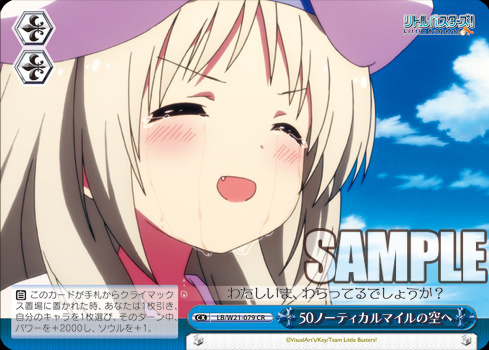 Kud returns with a Climax combo that can help increase your resources by drawing more cards. Taking the boost from the Climax and the combo together she could reach 9000 Power, which is even higher than Sasami could manage. 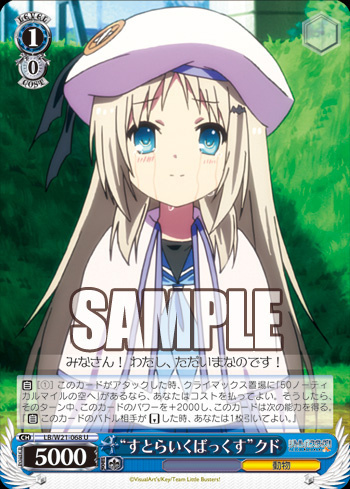 This means Kud should be able to handle most Level 1 cards, thus making it easier to draw an extra card. Even without the Climax boost she can still reach 7000, which is often enough to beat a 1/0. This would mean that you might even be able to pull off the full combo with more than one copy of Kud in a single turn. Since the Climax replaces itself, a fully successful combo will result in a 1 card resource increase for you, whilst your opponent will lose a card in battle. This is the Climax that goes with the above Kud. [AUTO] [(1) Place the top 1 card of your Deck in the Clock] When this card is placed on the Stage from your Hand, you may pay the Cost. If you do so, search your Deck for up to 1 Level 2 or higher character, reveal it to your opponent and add it to your Hand. Shuffle your Deck. 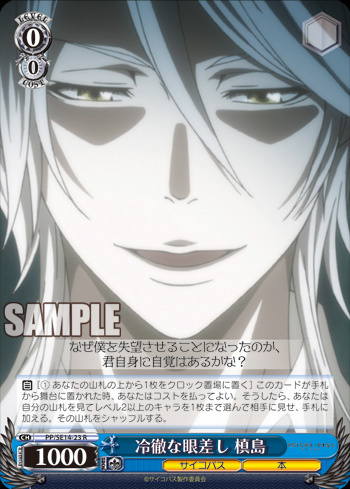 Our next Makishima is a searching card that will help grow your resources whilst setting up for later in the game. He’s a rare brand of search card that is not restricted by attribute, however he takes a heavy Power reduction and has a relatively big Cost because of this. The Stock requirements is low, but the fact that you have to take 1 damage to use it might sometimes make it offputting. Early in the game though this would probably be of little consequence. You might even find it useful for speeding up your progress to Level 1. With only 1000 Power there is practically nothing he can beat in battle, meaning you’ll almost immediately end up at break even in terms of resources. He can at least gain you 1 Stock though. I imagine you’d usually want to search for important support cards that you don’t want to see in the Waiting Room, instead of your Level 3s, since they would rather be in the Waiting Room in preparation for their Change. 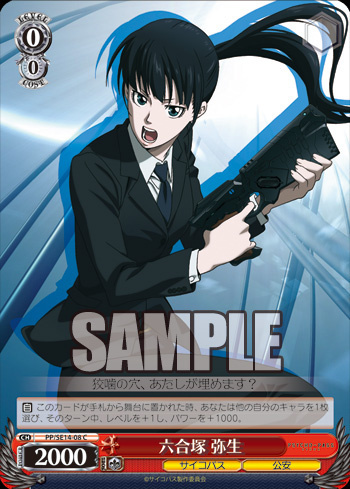 [AUTO] When you use this card’s [Backup], if you have 2 or more «サイコパス Psycho-Pass» characters, choose 1 of your characters, during that turn, it gains Power +1000. Che Guson makes his first appearance in card form, taking up the role of a Counter card. This type of Counter card is very useful, but we might need to wait on the full set reveal to truly judge its strength. With 2 «サイコパス Psycho-Pass» characters around this can either be a 2000 Counter for free, which is 500 above the standard, or you can split a 1000 boost across 2 characters. This could potentially save you in two battles for only a single one of your cards. Since you only need 2 «サイコパス Psycho-Pass» characters on the Stage you might be able to fulfill this just on supports alone, and you’re halfway there even with only 1 support card. 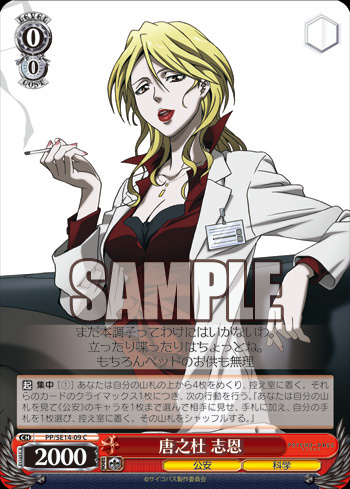 However not all of the cards in the set have «サイコパス Psycho-Pass», most notably the Akane cards, which might form the backbone of some of your supports. Once we know the distribution of the cards with and without this attribute it will be possible to properly assess this card, but we’ll have to wait just a little bit longer for that. [AUTO] When this card is placed on the Stage from your Hand, or via [Change], you may place the top 1 card of your Clock in the Waiting Room. Our final set of cards is a new Level 3 for Rin and her accompanying Climax. The Rin is fairly straightforward and uses the combo to reproduce the effect of the Climax, hopefully helping you towards victory. Her first effect is your standard healing effect, giving you incentive to play her even when you don’t have the Climax. The Climax combo increases her Power by 3000 (4000 if you include the Climax), making her a threat to many Level 3 cards. However it’s really the second half of her effect which you’re more interested in, since it could dramatically increase your chances of winning the game. Late game cancels are always annoying, especially when you only need 1 damage to win. By timing Rin correctly you can make it so your opponent will need to have two Climaxes in a row to stay in the game, which is usually very unlikely. [CONT] All of your characters gain Power +1000, Soul +1. This is the Climax for the above Rin. Whether you trigger it or draw it, it will allow you to nearly guarantee 1 damage off of one of your attacks.